Shoreline Medical Spa specializes in Kybella treatments, a non-surgical alternative to diminishing unwanted fat. Excess submental fat in the head and neck area can create an out-of-shape, lethargic-looking appearance, even in patients who exercise regularly and are in otherwise good physical condition. This can cultivate body issues and diminish self-confidence. That’s where Kybella comes in. Kybella is the one-and-only FDA-Approved injectable treatment that diminishes and destroys unwanted fat cells under the chin to contour your profile, to reverse the appearance of the dreaded double chin. A double chin can show its unwanted face as a result of several factors. Genetics, weight gain or weight change, and aging tend to be the main determiners of the structure of the chin. Strict exercise regimen and proper diet don’t always get the job done in this stubborn, elusive area. You can’t go to a gym and work out your chin, after all. Kybella injections dissolve stubborn fat, restructuring, recontouring your profile, balancing out the rest of your facial features. 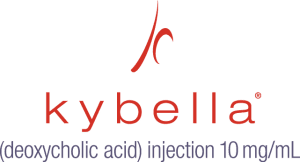 Kybella has been rigorously tested, a clinically-proven option specially designed to assist in achieving patient’s beauty enhancement ambitions. Those who do not wish to undergo surgical treatment for submental fat (liposuction) can now choose Kybella as a non-surgical alternative. In total, your in-office Kybella treatment will only take up 15 to 20 minutes of your time to perform by Shoreline Medical Spa. Number of injections required to achieve desired results will vary from case to case. 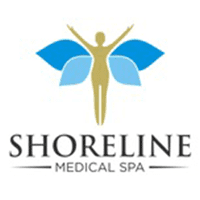 Shoreline Medical Spa does treat any situation or procedure as a one-size-fits-all sort of scenario.You'll start to see results after an average of one to three Kybella treatment sessions, each treatment one month apart. In select cases, up to six treatment sessions are requred to reach desired results. After we've achieved the patient's desired degree of change, no more treatments will be necessary. After treatment, some patients have might experience a certain degree of bruising, swelling, or numbness, possibly even a combination of these side effects. However, symptoms are temporary and fade quickly. Contact Shoreline Medical Spa today, and we’ll further discuss the ways that Kybella can benefit you. We offer this and many other non-surgical aesthetic enhancement procedures that can help unlock the optimum version of you.